Brussels sprouts have never been my vegetable of choice. Baked, roasted, or boiled, I’ve never particularly enjoyed eating them. Much to my husband’s dismay, that unfortunately means I rarely cook Brussels sprouts. A few years ago at one of his work holiday parties, he ordered the one dish that came with a side of Brussels sprouts and ever since, he’s been begging me to make something comparable. That’s nearly impossible since I didn’t even try them and they’re no longer on the menu at Lexington House. I turned his request for Brussels sprouts into an experiment to see if it was possible for me to not make a sour face upon taking a bite of one. I turned to my good friend Google and researched different methods of cooking Brussels sprouts and wrote down several ones to try for myself. Since I didn’t want to make this an impossible recipe, I stuck to the basics: boiled, roasted and sautéed even though I stumbled across an interesting Traeger recipe (since investing in a Traeger grill, I have ultimately decided that the Traeger is off limits for myself—that’s my husband’s toy). Because I started this recipe off somewhat backwards (I knew what sauce I wanted to use), I wrote down a few ideas I had that would blend well with my béchamel sauce. So, for one round I roasted the Brussels sprouts with garlic (my husband’s favorite), sautéed another batch in bacon drippings, and boiled them in rice wine vinegar. Would you believe me if I told you the rice wine vinegar was the clear-cut winner out of the six people I used as guinea pigs? The bitter aftertaste commonly experienced with Brussels sprouts was nowhere to be found. Don’t worry, they don’t actually taste like rice wine vinegar, which was my biggest concern. While I am still not on the Brussels sprouts bandwagon, I know that if they are cooked in this particular method that many people who aren’t crazy about them will at least be able to swallow them without grimacing or threatening to spit them out. 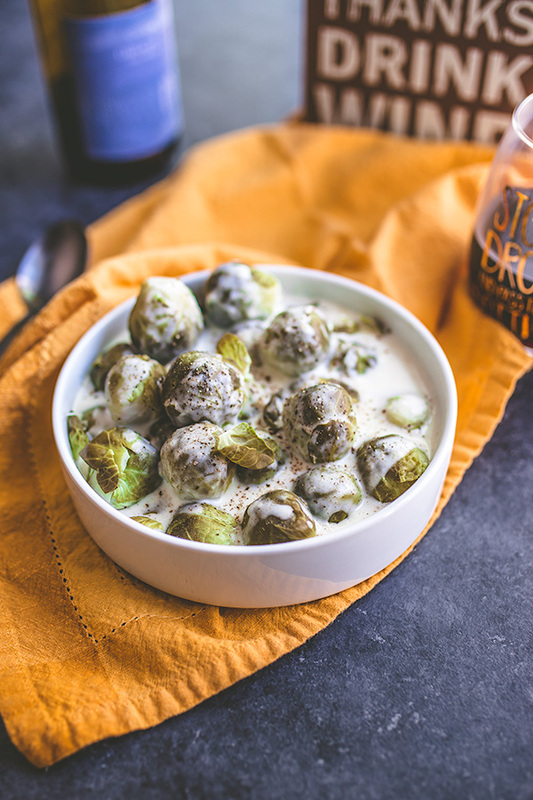 Once you add the creamy béchamel sauce, they’re quite enjoyable, even to those of us who say we hate Brussels sprouts. The intention of this Brussels sprouts gratin was to be served as a Thanksgiving side dish, so ultimately I wanted the recipe to be mostly cooked on the stovetop. If you are able to sneak this gratin into the oven under the broiler for a couple of minutes to crunch up the top, it makes this dish even better, but it’s pretty delicious even without it. f you’re cooking this as a main dish, the creamy béchamel sauce pairs well with Sauvignon Blanc, Pinot Grigio, Viognier (my personal preference), or Chardonnay. Avoid red wine as it will bring out more of the bitter characteristics of the Brussels sprouts, unless you’re into that sort of thing. Brussels sprouts gratin is cooked in such a way that even non-brussels sprouts eaters will enjoy. Place brussels sprouts in a large heavy pot, cover with water and add the rice wine vinegar. Bring to a boil over medium-high heat, cover and cook for 15 minutes, or cooked until just soft. Rinse under cold water and set aside. Cut in half if desired.In the same heavy pan used before, melt the butter over medium-low heat. Once melted, add the flour and whisk until mixer has thickened. DO NOT BROWN. Add boiling milk, and whisk until thick. Remove from heat, whisk in heavy cream, salt and pepper, and cheese if using. Return brussels sprouts to pot, and heat through on stove, about 5 minutes or until they reach desired tenderness. Do not boil sauce.Transfer to serving platter and serve with more pepper, and cheese, if using.